For four days in the first week of April, the United Nations held meetings to negotiate the possibility of a new international treaty to protect marine biodiversity. The UN working group, High Seas Alliance (HSA), a partnership of 27 non-governmental organizations, plus the International Union for the Conservation of Nature (IUCN), discussed creating a new treaty to provide additional conservation measures and to improve sustainable use of marine resources. HSA noted that the high seas and the seabed area make up 45 percent of the surface of the planet, making it a valuable resource. However, that valuable resource and all of the wildlife in it are currently under severe threat from habitat loss, climate change, ocean acidification, pollution, and overexploitation in commercial fisheries. If a new treaty can be created for protecting marine biodiversity, it will fall under the umbrella of the Convention on the Law of the Seas, which governs all aspects of ocean space, including the delimitation of maritime boundaries, exploitation of living and non-living resources, protection and preservation of the marine environment, marine scientific research, and the settlement of relevant international disputes. In the past the UN Secretary-General Ban Ki-Moon has encouraged more countries to join the UN Convention on the Law of the Seas. The Convention has been in force since 1994 and currently 165 of the 193 UN members have ratified it. A new treaty could be crucial, as the UN points out, “[m]arine biodiversity is vitally important for human well-being as it underpins a wide range of ecosystem services on which life depends.” In addition, not only is the possible treaty important but at the 2012 (Rio+20) meeting in Brazil the UN Member states committed to address marine biodiversity in order to preserve and restore healthy and productive oceans with rich marine biodiversity in order to ensure food security and the livelihoods of millions of people. Unfortunately, that same year the UN Food and Agriculture Organization released a report indicating that 87% of the world’s fisheries were either overexploited or fully exploited. Likewise, a new report released by Oceana explains that we still have a major problem with U.S. fisheries wastefully discarding by-catch. Every year 2 billion pounds of unintentionally caught fish or other marine animals are injured or killed by fishing practices and then tossed overboard. Poor resource management will diminish the global efforts to achieve a restored, healthy marine ecosystem. According to a senior advisor of Greenpeace International, Sofia Tsenikli, urgent action is needed to protect the oceans. She expressed, “It’s simply scandalous that still less than one percent of the high seas is protected.” The UN Secretary-General also called on countries to take action to achieve the Aichi Biodiversity Target of conserving 10% of marine and coastal areas by 2020. The Aichi Targets were adopted in 2010 at a Conference in Aichi, Japan. Target 6 read: By 2020, all fish and invertebrate stocks and aquatic plants are managed and harvested sustainably, legally and applying ecosystem based approaches, so that overfishing is avoided, recovery plans and measures are in place for all depleted species, fisheries have no significant adverse impacts on threatened species and vulnerable ecosystems and the impacts of fisheries on stocks, species and ecosystems are within safe ecological limits. After meeting last week, the High Seas Alliance will continue the discussion into the future and will present its recommendations on the possible international marine biodiversity treaty to the General Assembly in September 2015. There is hope for change as some countries are taking action now to address the existing threats. For example, Vietnam just released a new national strategy to confront several issues of concern for its marine ecosystem. The Vietnamese plan calls for an increase of 30% of their mangrove forests by 2020, an effort to maintain its coral reefs, and an effort to prevent aquatic species from becoming threatened with extinction. The government plans to implement the strategy by raising awareness about marine resources and providing training on sustainable management of the environment. Also, just last month the governments of Bermuda, Monaco, the Azores, the United Kingdom, and the United States came together to sign a declaration to conserve the Sargasso Sea. The declaration is called the ‘Hamilton Declaration on Collaboration for the Conservation of the Sargasso Sea’ – also known as the ‘Hamilton Declaration’ and it is the first time an international alliance has voluntarily come together to protect a high seas ecosystem using the existing international legal framework. The Sargasso Sea is located in the mid-Atlantic and is known for its unique floating seaweeds and rich biodiversity. The Sea is under pressure from wastewater discharge from ships, pollution, fishing, harvesting of Sargassum algae for fertilizer and biofuel production, and seabed mining. Government representatives from Sweden, Turks and Caicos Islands, British Virgin Islands, the Netherlands, Bahamas and South Africa expressed support for the declaration, together with five international organizations. The Hamilton Declaration, although a non-binding agreement, will serve as a platform to minimize adverse effects in the Sargasso Sea, which is home to numerous species such as angelfish, whales, dolphins, tuna, turtles, sharks, rays, and European and American eels. 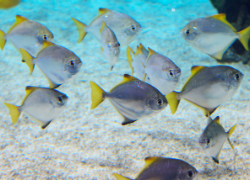 While the international community awaits the results of the UN working group’s meetings and discussions on a potential new treaty, other efforts made around the globe may help to mitigate the anthropogenic influences currently damaging our marine ecosystems. However, without further collaborative attempts to preserve our resources some marine species may end up permanently wiped out. Kristen Pariser is a 3L, a Staff Editor for the Denver Journal of International Law and Policy, and the Executive Editor for The View From Above blog. This is the final blog post in a series of three blog posts proposing that the Smart Grid is a possible contributing remedy to fighting global climate change. This post addresses potential obstacles and developments of the Smart Grid within the United States, the European Union, and China and touches on international collaborations amongst those three countries. The first blog in this series provided context about global climate change in general and detailed what the Smart Grid is. The second blog in this series analyzed the Smart Grid on a more country-specific level and discussed how the United States, the European Union, and China define and value the Smart Grid. 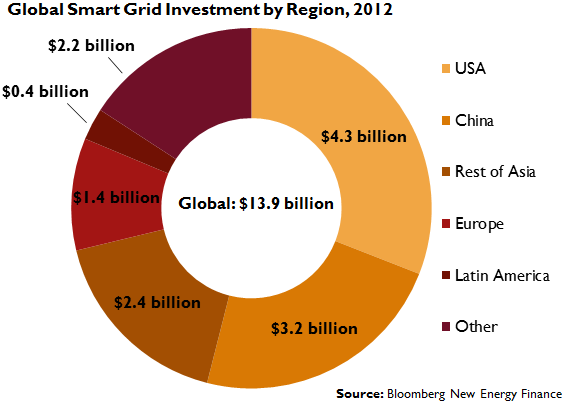 Smart Grids are gaining global traction. 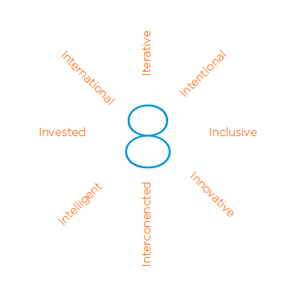 This provides room for collaboration and capitalization on country strengths. U.S. Deputy Energy Secretary Daniel B. Poneman has stated that top greenhouse gas emitters like the United States (“U.S.”) and China have a common duty to remedy climate change and secure alternative energy sources. Generally, national legal frameworks like the Energy Independence and Security Act of 2007, federal stimulus money, and utility-driven initiatives “to add value and increase system efficiencies” have supported U.S. Smart Grid developments whereas Smart Grid deployment in the European Union (“E.U.”) significantly depends upon “policy mandates to meet environmental and climate goals” and China’s Smart Grid development has hinged upon significant state funding from the State Grid Corporation of China. Nonetheless, Smart Grids are progressing despite being a part of the notoriously slow-changing electrical industry. These three countries have strengths that have the potential to benefit the global development and adoption of Smart Grids. For an audio account of U.S. strides in the Smart Grid from the 2013 U.S. Smart Grid Year in Review webinar held on December 5, 2013, click here. China’s smart meters are anticipated to be half the price of those in the U.S. and E.U. This price difference is largely “attributable to cheaper labor and installation costs, shorter meter life span, no import taxes and lower transportation costs, and use of power line communications, which require few changes to existing transmission infrastructure.” The E.U.’s deregulated market suggests more grid automation than in the U.S., which may promote more rapid smart meter deployment. The U.S., the E.U., and China also face similar obstacles with respect to Smart Grids, which make collaboration with each other, and the greater international community, beneficial to further domestic and global climate change progress. Because most of the Smart Grid’s key components already exist, “better communication, coordination, and incentives for consumers, power suppliers, and government agencies” are more important than expending resources to make the technologies more advanced. Problems include increased electricity bills, implementation cost recovery, and job loss and shortages. Specifically, consumer expectations and education regarding energy present a universal obstacle in consumer acceptance of the Smart Grid. U.S. consumers have evolved to meld the concept of luxury with “profligate waste.” Similarly, China, as a developing country, may be more concerned with economic growth, and the increased consumerism and pollution that result from urbanization, than being environmentally sound. As a developing country, the focus tends to be on economic growth at the expense of environmental degradation. However, some scholars hypothesize that once that country becomes more industrialized, the environment will become more valuable and protected. Generally, science has demonstrated that humans have an innate tendency to over-consume, rather than conserve, to attract mates and reproduce. Perception shifts of energy from a public good to a valuable resource are essential to energy efficiency being a viable solution to global climate change. Daniel Yergin advocates that conservation and energy efficiency should “become ‘part of our DNA.’” He described that Japan is a global energy efficiency leader because of its “deep-seated cultural value of ‘mottainai’, which translates as ‘too precious to waste.’” As a solution, the U.S., the E.U., and China have been addressing consumer education with respect to the Smart Grid, but some criticize the E.U. and U.S. as inadequately reaching out to consumers. 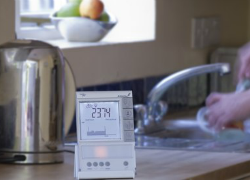 This year, it is estimated that smart meters in the United Kingdom have motivated a significant number of consumers to become more energy efficient. Also, as of December 2013 in the U.S., consumer awareness of the Smart Grid has increased despite the low energy prices and stability of the grid. Regrettably, these two factors generally decrease consumer motivation to adopt energy efficient measures. Privacy of Smart Grid-generated data is also problematic because Smart Grid technologies are capable of giving utilities and third parties access to more detailed energy data. For example, in Kyllo v. United States, in order to substantiate a search warrant, police used a thermal imaging device from outside of the defendant’s home to detect amounts of heat emitted from inside the home, which were consistent with lamps typically used for growing marijuana. 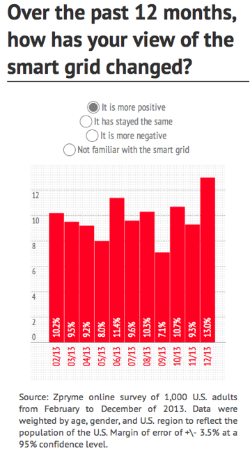 In a 2014 Smart Grid Cybersecurity Survey of energy executives, a majority considered the Smart Grid unprepared for security-related problems. “The challenge is upon the entire smart grid ecosystem, from suppliers to [original equipment manufacturers] to utility companies to regulators and even to consumers, to embrace a concerted security direction and efficiently protect these advancements,” said Scott Emley, SMART Modular Technologies VP & GM, Integrated Memory Solutions. E.U. privacy laws are comprehensive because one regime applies to different industries whereas, in the U.S., various sectors enforce unique standards. China is considered devoid of streamlined energy decision-making. In the U.S., Naperville Smart Meter Awareness v. City of Naperville is a recent district court decision where plaintiffs unsuccessfully alleged that the city violated their right to be free from unreasonable searches pursuant to the Fourth Amendment when installing smart meters onto their homes. In light of these common obstacles regarding the Smart Grid, the U.S. and China have made significant collaborative efforts to promote Smart Grid developments. Under the China-U.S. 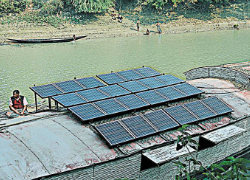 Ten Year Framework for Energy and Environment, they began Smart Grid-related projects. In 2012, the United States Trade and Development Agency sponsored a meeting between China’s National Energy Administration and the U.S. Federal Energy Regulatory Commission to exchange “standards and policy, distribution, generation, state-of-the-art applications, communications, and control and management systems.” In 2013, China and the U.S. entered agreements to exchange Smart Grid research and inspire other countries to similarly confront climate change. The Intergovernmental Panel on Climate Change confirms that the climate is warming at deleterious rates largely because of human activity. International agreements such as the Kyoto Protocol have stressed that all countries have a common responsibility to mitigate climate change, but in ways based on their unique economic and social situations. Smart Grid development and deployment contributes to that common responsibility because the Smart Grid enables cleaner, less fossil fuel-based energy sources to be integrated into the electrical grid and increases energy efficiency and conservation, which all decrease the amount of greenhouse gases emitted into the atmosphere. Therefore, collaborative Smart Grid efforts have strong potential of making a positive impact on assuaging the criticalness of global climate change. Jaclyn Cook is a 3L and a staff editor for the Denver Journal of International Law & Policy. See Jaclyn Cook, The Smart Grid: How the International Community is Combating Climate Change (Part 1 of 3), The View from Above (Feb. 25, 2014); The Smart Grid: How the International Community is Combating Climate Change (Part 2 of 3), The View from Above (Feb. 25, 2014). Lynn Garner, China State Grid Corp. President Calls Smart Grid Crucial for Continued Growth, BNA, Jan. 19, 2011, http://climate.bna.com/climate/summary_news.aspx?ID=153000. Michal Meidan, Philip Andrews-Speed & Ma Xin, Shaping China’s Energy Policy: Actors and Processes, Journal of Contemporary China 615 18(61) (2009). Avi Brisman, It Takes Green to Be Green: Environmental Elitism, “Ritual Displays,” and Conspicuous Non-Consumption, 85 N.D. L. Rev. 329, 355 (2009). Richard J. Lazarus, Super Wicked Problems and Climate Change: Restraining the Present to Liberate the Future, 94 Cornell L. Rev. 1153, 1175 (2009). Kyllo v. United States, 533 U.S. 27, 34 (2001). Joel B. Eisen, China’s Renewable Energy Law: A Platform for Green Leadership?, 35 Wm. & Mary L. & Pol’y Rev. 1, 6 (2010). Naperville Smart Meter Awareness v. City of Naperville, 11 C 9299, 2013 WL 1196580 (N.D. Ill. Mar. 22, 2013). Anthony Adragna, U.S.,China Announce New Working Group To Promote ‘Forceful’ Climate Change Action, BNA, Apr. 15, 2013, http://climate.bna.com/climate/summary_news.aspx?ID=235708. This is the second blog post in a series of three blog posts proposing that the Smart Grid is a possible contributing remedy to fighting global climate change. This post analyzes the Smart Grid on a more country-specific level and discusses how the United States, the European Union, and China define and value the Smart Grid. The first blog in this series provided context about global climate change in general and detailed what the Smart Grid is. The final blog in this series will address potential obstacles and developments of the Smart Grid within the United States, the European Union, and China and will touch on international collaborations amongst those three countries. No global definition of Smart Grids exists, but the basic concept is universal. One scholar has defined Smart Grids as “electricity system[s] that [use] information technology (IT) to connect those who generate and transmit electricity with those who consume it.” The United States (“U.S.”), the European Union (“E.U.”), and China share similar developmental rationales, which include increasing energy capacity, reliability, efficiency, affordability, security, and global competitiveness; decreasing energy-related environmental impacts; and integrating renewable energy into the grid. With those considerations in mind, the U.S. and the E.U. 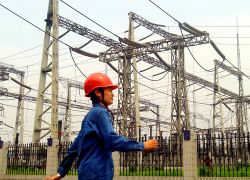 most similarly define the Smart Grid, and China has a slightly different perspective. The E.U. also has a centrally planned grid where fossil fuels dominate. The E.U.’s Smart Grids Task Force (“SGTF”) defines the Smart Grid as “an electricity network that can cost efficiently integrate the behaviour and actions of all users connected to it – generators, consumers and those that do both – in order to ensure [an] economically efficient, sustainable power system with low losses and high levels of quality and security of supply and safety.” It also focuses on the dynamic communication between consumers and utilities through “intelligent metering and monitoring systems.” Smart Grids in the U.S. and E.U. rely upon smart meters to achieve energy efficiency. Similar to the U.S. and E.U., China’s Smart Grid refers to “an intelligent system capable of seamlessly integrating” alternative, renewable energy sources, such as wind and solar, into the electricity grid. The State Grid Corporation of China (“SGCC”) describes Smart Grids as delivering more reliable and powerful electrical transmission and distribution to the whole country. China’s National Climate Change Programme defined its “intelligent system” as “DC transmission technology and super high voltage transmission technology and equipment, grid transmission and distribution technology for intermittent power sources[,] . . . large-scale interconnected grid security technology[,] . . . grid management automation technology, [an] information technology and efficient management of supply and distribution system[,]” and phasing out technology that is inconsistent with new and enhanced energy efficiency standards. As top emitters and energy consumers, the U.S., the E.U., and China have strong motivations for adopting the Smart Grid and have already implemented some of its components, like the smart meters. The current grid’s primary function is to ensure lights stay on, but modern concerns include reliability, efficiency, affordability, and the environment. The U.S. is the world’s largest energy consumer, and in 2009, energy from fossil fuels totaled more than 50% of energy consumption while renewables made up about 9%. Also, the U.S. represents about 4% of the global population, but emits nearly a quarter of its greenhouse gases. Based on 2014 data, the U.S. population hovered over 318,000,000, and its 2011 electricity consumption per capita was 13,246 kWh compared to 3,298 kWh in China and 5,516 kWh in the United Kingdom. Clean energy is slowly gaining ground in the U.S.
Smart Grids began in the U.S. around 2001. Congress enacted the Energy Independence and Security Act of 2007 (“EISA”), which declared the U.S.’s modernization of its electrical transmission and distribution, to address these new concerns in the form of the Smart Grid. EISA established the Smart Grid Task Force “to insure awareness, coordination and integration of the diverse activities” of Smart Grid practices, policies, and technological components. EISA also directed each state’s electric utilities and other related entities to consider investing in and implementing the Smart Grid. Thus, states could require utilities to implement aspects of the Smart Grid. For instance, some utilities must replace obsolete residential meters with smarter, digital ones. EISA directed the National Institute of Standards and Technology (“NIST”) to organize the Smart Grid’s interoperability framework to ensure consistency of all related entities and technologies. In 2005, there were about 150 million traditional energy meters in the U.S., but less than two million were “smart.” In 2009, President Obama injected $3.4 billion into the Smart Grid Investment Grant awards for system investments, trial implementations, and capacity building. Private industries matched this funding making for a total of $7.8 billion. Estimates now suggest that by 2015, 50 million more smart meters will be implemented. A few states, like California7 and Maryland, have already widely implemented smart meters. Many cities have Smart Grid projects. In 2006, the European Community (“the Community”) recognized a need for energy efficiency and renewable energy to assuage energy usage, greenhouse gas emissions, and climate change effects, and to help wean the Community from reliance on foreign energy sources. Nuclear and coal dominated the electricity energy mix. Therefore, the Community enacted the energy end-use efficiency directive to achieve those needs. The directive stated that human activity in the energy sector had caused around 78% of greenhouse gas emissions in the Community, and therefore, Member States were required to “adopt national indicative targets to promote energy end-use efficiency.” Additionally, the directive required each Member State to complete an action plan outlining strategies for satisfying the directive. In 2009, the European Commission first mentioned smart meters in a mandate for establishing E.U. standards “that [would] enable interoperability of utility meters (water, gas, electricity, heat), which [could] then improve the means by which customers’ awareness of actual consumption [could] be raised in order to allow timely adaptation to their demands.” In the Third Energy Package, the Community specifically addressed Smart Grids in efforts to modernize its electrical distribution system by decentralizing generation and increasing energy efficiency. This directive described that implementing smart meters to 80% of the E.U. by 2020 was the most pivotal stride for Smart Grids. The European Commission tasked the SGTF with advising it on policy and regulations to implement Smart Grids at the community level. The SGTF organized expert groups that considered creating and revising standards, creating proposals for smart meter data privacy, and defining regulatory recommendations for business models that encourage grid deployment. The Energy Roadmap 2050 reiterated these goals in light of a “sustainable and secure energy system.” A smarter grid promotes energy efficiency and integrates renewables, which are more intermittent in generation than fossil fuels. It also makes the E.U.’s goal of reducing emissions to 80-95% of 1990 levels by 2050 more attainable. China is the world’s second largest energy consumer and strives to be a global contender in all respects, which includes being the alternative energy leader. With the world’s largest population at 1,317,000,000, China’s electricity consumption per capita in 2011 was 3,298 kWh. One of the government’s goals is lowering “energy consumption per unit of GDP by 15 percent” by 2015. Also, the Renewable Energy Law of 2005 stated a goal of a 10% renewables mix by 2020. Because China derives most of its power from coal and its electricity meters are “relatively low” quality, China is motivated to transition into cleaner energy. Complicating the shift is that Chinese citizens are rapidly migrating from the country to cities, which increases energy demand threefold. In 2007, the Chinese government pledged to “make great efforts to develop new and renewable energy technologies and new technologies of energy conservation” in China’s National Climate Change Programme (“CNCCP”). The CNCCP envisioned elements of the Smart Grid. Also, China’s 2007 Energy Conditions and Policies report enunciated some grid-related goals that have Smart Grid implications: modernizing the grid, increasing energy efficiency and energy conservation, strengthening power transmission and distribution, creating “emergency response system[s] for power safety and reliability,” enforcing the Renewable Energy Law, and enhancing rural grids. 2009-2010 – The planning and testing phase included creating a development plan, “technical and operational standards,” technology, and trial implementations. 2011-2015 – Smart Grid framework for actual operation will be created and, after technological improvements occur, the Smart Grid will be deployed countrywide. 2016-2020 – The Smart Grid will be upgraded and completed “with [the] most advanced technology and equipment.” By 2016, China is expected to have implemented 280 million smart meters. In 2009, SGCC, the “largest State-owned utility” company worldwide, declared its intention to construct a grid that is strong and smart by 2020. China has at least 15 city demonstration projects. In 2010, a Chinese power company implemented various Smart Grid technologies into one smart community that included 655 homes and 11 commercial buildings. The highly centralized structure of China’s government allows for faster policy development and implementation. Smart Grids have enabled local governments to exercise more power over their respective regions by investing in local Smart Grid projects. As a byproduct of China accomplishing its goal of providing strong energy countrywide, its electrical distribution and transmission system must necessarily become efficient in order to sustain that increased energy demand. The U.S., China, and the E.U. have acknowledged their present and future energy needs and are taking measures to ensure that their people have electricity. However, their adoption of environmental policies and Smart Grid initiatives demonstrate that they are also taking the environment into account. As energy efficiency technologies like the Smart Grid continue developing, the larger benefits remain to be seen through collaborative technology transfer between countries. Mariusz Swora, Intelligent Grid: Unfinished Regulation in the Third EU Energy Package, 28 J. Energy & Nat. Resources L. 465, 466 (2010). Litos Strategic Commc’n, The Smart Grid: An Introduction 7-8 (2008), available at http://energy.gov/sites/prod/files/oeprod/DocumentsandMedia/DOE_SG_Book_Single_Pages(1).pdf; EU Comm’n Task Force for Smart Grids, Expert Group 1: Functionalities of Smart Grids and Smart Meters 22 (Dec. 2010), available at http://ec.europa.eu/energy/gas_electricity/smartgrids/doc/expert_group1.pdf. Miranda A. Schreurs, Henrik Selin & Stacy D. VanDeveer eds., Transatlantic Environment and Energy Politics: Comparative and International Perspectives 151 (2009). See Jaclyn Cook, The Smart Grid: How the International Community is Combating Climate Change (Part 1 of 3), The View from Above (Feb. 25, 2014), URL to Part I (describing smart meters). Richard Cowden, Obama, Congress Could Work Together on Pragmatic Energy Efficiency Programs, BNA, Feb. 15, 2013, http://www.climate.bna.com/climate/summary_news.aspx?ID=231636. 7 Pacific Gas & Electric, Getting Your SmartMeter Device, http://www.pge.com/en/myhome/customerservice/smartmeter/installation/index.page (last visited Jan. 31, 2014) (installed around 9.5 million smart meters); San Diego Gas & Electric, Smart Meter Deployment Metrics, Q1 2013 January 1, 2013 – March 31, 2013, http://www.sdge.com/residential/about-smart-meters/smart-meter-deployment-metrics-0 (last visited Jan. 31, 2014) (installed about 2.2 million smart meters). Schreurs, supra note 3, at 148. Joel B. Eisen, China’s Renewable Energy Law: A Platform for Green Leadership?, 35 Wm. & Mary L. & Pol’y Rev. 1, 1 (2010). John Copeland Nagle, How Much Should China Pollute?, 12 Vt. J. Envtl. L. 591, 613 (2011). This is the first blog post in a series of three blog posts proposing that the Smart Grid is a possible contributing remedy to fighting global climate change. This post provides context about global climate change in general and details what the Smart Grid is. The second blog post discusses the Smart Grid on a more country-specific level and analyzes how the United States, the European Union, and China define and value the Smart Grid. The final blog post will address potential obstacles and developments of the Smart Grid within the United States, the European Union, and China and will touch on international collaborations amongst those three countries. The international community is undoubtedly in consensus that climate change is occurring and the earth is warming largely due to human actions. In fact, since the United Nations Framework Convention on Climate Change in 1992 most nations recognize the need to collaborate on how to stabilize global greenhouse gas emissions. Many countries, including the United States (“U.S.”), the European Union (“E.U.”), and China, have agreed that all countries have “common but differentiated responsibilities” in remedying climate change that differ based on their economic and social environments and historic and present generation of emissions. Top emitting countries, like the U.S., the E.U., and China are adopting strategies, like the Smart Grid, to become more energy efficient and reduce energy consumption. The Smart Grid’s dynamic nature allows for intermittent alternative energy sources to be more easily integrated into the traditional, existing electricity grids. As countries consider shifting away from fossil fuel-based energy to renewable energy sources, Smart Grids use digital, interactive technology that allows integration of renewable energy into the grid to be used as power. Because renewable energy is “virtually [a] free” energy source, renewables are considered a threat to the traditional grid, which is regarded as rigid and unreliable in an era where electricity demand is only increasing. By using less energy, consuming energy more efficiently, and integrating more renewable, lower emission energy sources into the grid, the Smart Grid is a promising component in the international community’s fight against climate change. What is the “Smart Grid”? Using the U.S. as an example, the dominant electric grid, which was developed in the 1890s, is centralized and an electricity provider controls it. The provider, through its system operators, must match generation of electricity with demand on an almost minute-by-minute basis. It is a one-way, utility-to-consumer process. By contrast, the grid becomes “smart” as a result of “the digital technology that allows for two-way communication between the utility and its customers, and the sensing along the transmission lines.” Smart Grids are premised on integrating renewable energy sources into the grid and increasing energy efficiency, which means less energy will be used and the energy that is used will come from clean, fossil-fuel free sources. Therefore, Smart Grids have a positive effect on climate change because they reduce emissions that contribute to global warming. Powered by “today’s twin challenges” of reducing greenhouse gas emissions in an electricity hungry world, Smart Grid development is largely based on the need to integrate renewable sources of energy into the grid and mitigate effects that emissions have on climate change. The Smart Grid attacks the challenges by also promoting energy efficiency, which has been called “the fifth fuel.” It attempts to provide energy that is more reliable and more efficient. For example, electricity companies would be better able to detect power outages and prevent wide-scale blackouts because the Smart Grid’s electric system is digital and can communicate with the digital meter on one’s home. In short, the company response time to such situations would be faster. We live in an age where electrical grid failures, and resulting blackouts, are alarmingly common and more and more consumers continue burdening the grid with their voracious appetite for electronics. So, the Smart Grid’s responsiveness to consumer needs makes energy more reliable. The Smart Meter is one of the key devices that allows the Smart Grid to increase the two-way communication between a utility company and the consumer that is characteristic of the Smart Grid. In contrast to analog meters that attach to the outside of most U.S. homes, “smart” meters are digital. Therefore, they allow for the grid to be responsive to fluctuating energy prices and supply and demand as those changes occur in real time. This is significant because they have the potential to decrease “the high cost of meeting peak demand” and render peak power plants unnecessary. Removing these power plants, which typically use fossil fuels, undoubtedly helps mitigate climate change. Using an energy management system, home residents may view their smart meter data and electrical consumption information on personal computers or cellular phones. The system enables residents to automate their energy usage according to “real-time information and price signals from [their] utility” so they only run their high-efficiency dishwashers or washing machines, for example, during times prices are low. These types of household appliances (e.g., refrigerators, hair dryers, computers, washing machines) represent about 60-90% of energy consumption in the residential sector so this dynamic communication is essential to delivering cost-effective, reliable, and energy-efficient electricity to consumers. In the U.S., the number of consumers checking their energy usage on mobile devices has increased and these devices are crucial in engaging consumers as the Smart Grid gains more traction in 2014. Currently, U.S. technology is capable of measuring the power in kilowatt-hours of specific devices within homes. So, in gathering home energy data, smart meters may be capable of exposing one’s personal details. The meter may reveal data, called consumer-specific energy-usage data, about when the occupant is not home, whether one has a home alarm system, or whether one is toasting bread in the morning. More detailed consumer usage data benefits the Smart Grid because if electric companies know exactly how much energy specific appliances need, then they are better able to meet a household’s electrical demand. This data also allows consumers to program their appliances to turn on when energy is the cheapest. Presently, however, the “state of the art, in terms of the granularity of data collected by utilities using advanced metering, cannot yet identify individual appliances and devices in the home in detail, but this will certainly be within the capabilities of subsequent generations of Smart Grid technologies.” Nonetheless, as the smart meter develops to reach its full potential for consumers and utilities, it will necessarily have to detect specific appliances being used at specific times of day for specific amounts of time. The Smart Grid’s success depends upon this real-time consumer electricity data. 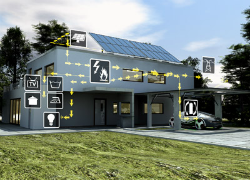 The Smart Grid is the 21st Century’s electricity grid. Our society is increasingly more interactive, dynamic, and digital in nature so an electrical grid that also possesses these characteristics is only fitting. The global population is increasing, and the U.S, the E.U., and China make it clear that countries are taking action to ensure their present and future generations have access to clean, efficient, and reliable electricity. See e.g., Energy Independence and Security Act of 2007, H.R. 6, 110th Cong. 110-140 (2007), http://www.gpo.gov/fdsys/pkg/PLAW-110publ140/pdf/PLAW-110publ140.pdf; Directive 2006/32/EC of the European Parliament and of the Council of 5 April 2006 on Energy End-Use Efficiency and Energy Services and Repealing Council Directive 93/76/EEC, OJ 2006 L 114/64, available at http://eur-lex.europa.eu/LexUriServ/LexUriServ.do?uri=OJ:L:2006:114:0064:0064:en:pdf; China’s Twelfth Five Year Plan, http://cbi.typepad.com/china_direct/2011/05/chinas-twelfth-five-new-plan-the-full-english-version.html. Greenpeace Says Smart Grid Could Help E.U. Meet Most Needs From Renewables by 2050, BNA, Jan. 19, 2011, http://climate.bna.com/climate/summary_news.aspx?ID=153003&hhterm=U3RlcGhlbiBHYXJkbmVy&hhtype=QWxsV29yZHM%3D. Mariusz Swora, Intelligent Grid: Unfinished Regulation in the Third E.U. Energy Package, 28 J. Energy & Nat. Resources L. 465, 466 (2010). Xcel Energy, Xcel Energy Smart Grid: A White Paper 2 (2008), available at http://www.e-renewables.com/documents/Smart%20Grid/Xcel%20Energy%20Smart%20Grid.pdf. Edward H. Comer, Transforming the Role of Energy Efficiency, 23 Nat. Resources & Env’t 34, 34, (2008). Xcel Energy, supra note 4. Cheryl Dancey Balough, Privacy Implications of Smart Meters, 86 Chi.-Kent L. Rev. 161, 166 (2011). Nat’l Inst. of Stds. & Tech., Guidelines for Smart Grid Cyber Security: Vol. 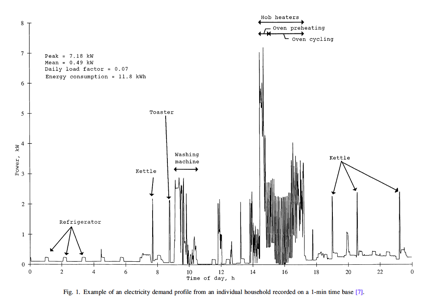 2, Privacy and the Smart Grid 12 (2010), available at http://csrc.nist.gov/publications/nistir/ir7628/nistir-7628_vol2.pdf. This July, Australia abandoned its plans to implement a carbon tax. Prime Minister Kevin Rudd stated that the reason was to reduce the burden on consumers and small businesses. This news would seem to suggest that Australia wanted to avoid the repercussions of reducing carbon dioxide emissions; however, the tax was instead replaced by a market-based trading system (cap and trade) a full year ahead of schedule. Prime Minister Rudd called combating climate change “the greatest moral challenge of our time.” Australia’s scheme is just one example of the growing movement towards a global carbon market. While the Kyoto Protocol provided a framework for carbon trading, many regional systems have emerged in recent years. The success of these markets has varied, and creating a unified global market represents a huge potential both in economic and environmental terms. Both a carbon tax and carbon trading scheme create incentives to reduce CO2 emissions. A carbon market differs from a tax in that there are a limited number of credits or allowances for CO2 emissions and the market determines the cost thereof. A fundamental feature is that an overall reduction target limits the total amount of permitted emission. The Kyoto Protocol included the basis for a trading scheme to allow countries a mechanism to meet their obligations under the treaty. It has been largely ineffective due to the surplus of credits available as well as the U.S. not participating, Japan withdrawing, and China’s exemption. One of the most prominent carbon markets in the world is the E.U. Emissions Trading Scheme, which also suffers from an abundance of carbon allowances. 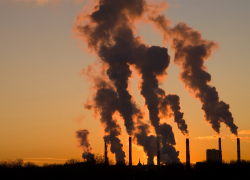 A coordinated, global effort is needed to address the economics of carbon emissions. Excess carbon dioxide in the atmosphere can disrupt the carbon cycle for between 500 and 1000 years if left to natural processes. Because every region of the world contributes to CO2 emission, and once in the atmosphere, CO2 pollution from one region is indistinguishable from another, and because the impact is so far removed in time from the source of emission, it is entirely impossible for the free market to curb CO2 emissions without a cost imposed on such emission. A carbon market may provide incentives to reduce emission commensurate with the ambitiousness of overall carbon reduction, but it does not provide an accurate price for removing existing CO2 from the atmosphere. Carbon removal technologies are an assumption built-into many climate models which project that they are crucial to remaining below the 2°C threshold identified by the Intergovernmental Panel on Climate Change (IPCC). Atmospheric carbon removal will need financial backing and a profit-motive if they are to be viable. Several technologies show potential in reducing atmospheric CO2. Direct carbon capture from the flue of sources like power plants is available but expensive with a high parasitic energy level. Alternatives are gaining ground: a combined CO2, SO2, NOx system with a net carbon reduction now exists for ships, artificial trees are currently being tested and scaled to larger sizes, while afforestation and biochar uses vegetation to disrupt the carbon cycle. Converting CO2 to calcium carbonate is also a potential method of sequestering CO2 rather than pumping it back into wells for enhanced oil recovery. New technology for cement production makes efficient use of such calcium carbonate (in addition to avoiding CO2 emission typical of ordinary cement production). 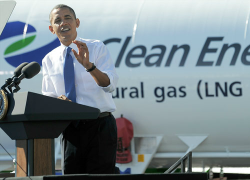 President Obama recently outlined his plan for combating climate change, and creating a viable carbon market through tax or other means that would recognize the long-term impact and costs of CO2 pollution and create opportunity for innovation and job growth, not to mention make alternative energy more appealing financially. Several Republican former administrators of the Environmental Protection Agency just endorsed such approach in an op-ed to the New York Times. Although CO2 pollution is a global issue that needs to be addressed at the international level accordingly, the initiative can begin domestically. Alex Milgroom is a 3L at the University of Denver and the Online Editor-in-Chief of the Denver Journal of International Law and Policy. We are living in a new geological epoch where humans are the foremost changers of the environmental systems upon which we depend. Nicholas Robinson, Co-Director of the Center for Environmental Legal Studies at Pace Law School, kicked off the 45th Annual Leonard v.B. Sutton Colloquium in International Law at the University of Denver Sturm College of Law with this idea about sustainability. 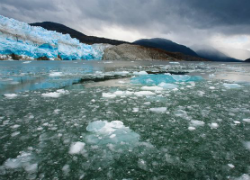 “Humans are going to have to adapt to a changing planet and climate,” Mr. Robinson said. “We [must] do it or it will happen to us.” He cited his difficulty in traveling to Denver for the Colloquium due to Hurricane Sandy as one example of climate change “happening to us,” and our already evident challenges in adapting to it. Don’t forget about the glaciers! Mr. Robinson asked the question of whether or not sustainability is a viable model to tackle these challenges. He questioned whether the sustainability model, as it stands now, is sufficient to allow adaptation to the extreme damage caused in the Northeastern U.S. by Hurricane Sandy or if it adequately repaired the damage by Hurricane Katrina, explaining that 40 percent of New Orleans residents did not return to their city after the hurricane. A conclusive answer to this question is difficult, and Mr. Robinson stressed that there is no clear vision for the international community’s next steps toward tackling sustainability issues. Fortunately, Mr. Robinson has a suggestion about how the sustainability debate should be tackled. If we are truly in this Anthropocene period driven by human impact, “we have to be the stewards of this [epoch].” Simply put, we must change our behavior. To do this, he suggests three principles to guide our behavior. First, we must cooperate globally to stabilize the human relationship with nature. Principles of cooperation are already enshrined in international law, as laid out in Articles 55 and 56 of the United Nations Charter, for example. These international law principles can provide a foundation to build upon as the world community comes together to finds solutions for sustainability. Second, we must build a stronger collective desire to protect our planet. Mr. Robinson explained the concept of “biophilia,” or the love of living things, to demonstrate that humanity has a natural affinity for the planet. He suggested that we “need to elevate this concept of love of the planet in order to protect the planet as a principle of law.” Our concern for the planet must become such that we afford it stronger legal protections. Third, we must utilize our ability as humans to be resilient. Ecosystems have natural resilience, Mr. Robinson explained. They either reset or adapt to changes. Humans also have this type of resilience and we must capitalize on it as we adapt to change our own behavior. These three traits can be the basis for sustainability. Without coming up with common themes like these to guide our behavior, Mr. Robinson concluded, our planet will not bounce back. Brianna Evans is the Editor in Chief of the Denver Journal of International Law & Policy and a third year law student at the Sturm College of Law.